Coffea laurentii De Wild. Compt. Rend. Congr. Intern. Bot. 1900: 234 (1900). Coffea robusta L.Linden, Cat. Pl. Econ. 11 & 64 (1900). Coffea bukobensis A.Zimm., Pflanzer 4: 326 (1908). Notizbl. Bot. Gart. Berlin 1, 237, 1897. 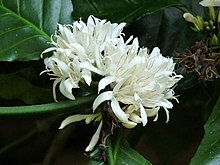 For more multimedia, look at Coffea canephora on Wikimedia Commons. This page was last edited on 31 March 2019, at 00:17.